My friend Megan is having an AWESOME giveaway on her blog. Check it out here. 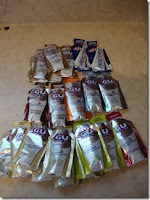 The lovely people at GU sent me samples – and a TON of them! I have quite a few flavors to try out! And it’s perfect timing as my runs are starting to get longer. They sent a lot of vanilla bean – which I’m thinking may be best for me. Since they sent me a lot…I’ve decided to share with you! Yep – these can all be YOURS! Here’s what you need to do. Comment below on what flavor you are excited to try (1 entry). Facebook about my giveaway (1 entry). 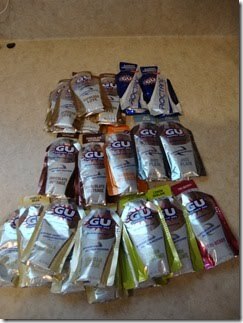 Follow me on Twitter @runningtoprize (1 entry). Tweet about my giveaway (1 entry). Give a shoutout about my giveaway on your blog (1 entry). Yes – that’s 5 possible entries! Leave a comment for each entry. But be quick – the giveaway will end at midnight on March 9th!